The menopause supplement works on the premise that the key to treating menopausal symptoms is the restoration of the body’s internal systems. It is specially developed to promote the hormonal balance in the body which addresses the primary cause of menopause symptoms. Amberen is a daily regimen. This means you should take two capsules – one white and one orange – daily after breakfast. Consider drinking caffeine-free liquids when taking Amberen. “I had to stop taking it after 16 days…I have a rash and hives…I have never in my life had a reaction like this before. I had a constant headache and I think it kept me up at night. On the plus side, increased energy, but I actually GAINED weight on this product. So disappointed,” offered another. We noticed that the official website for Amberen talks about proven clinical science. However, if you take a close look at the studies, you will see that they do not support weight-loss as claimed. A month supply is 49.99 and a 90-day pack is priced at $99.98. There is a 45-day money back guarantee but that applies only to orders processed and shipped by Lunada Biomedical. 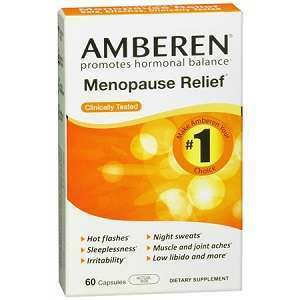 We love Amberen’s website it is calming and inviting and fills you with confidence in this product. We are disappointed Amberen does not contain Protykin. This ingredient provides potent antioxidant, anti-inflammatory, and anti-cancer activities and is the active ingredient in many really good Menopause supplements. The ingredients that are used have been useful in helping in this condition but given the side effects that have been noticed we’re not so sure about it. It is helpful that there’s a decent money-back guarantee but you need to purchase from the company otherwise it is not upheld. One should be wise enough to research other products that are similar in the market rather than go with the first one that is out there. Jackie Horowitz	reviewed Amberen	on March 23rd	 and gave it a rating of 3.